Serviced a Dell Inspiron M5030 laptop that what appeared at first to be a broken dc power jack. The Dell M5030 laptop ran on battery, but no power from power cord, and battery would not charge. The dc jack from outside of the laptop was solid, was not loose and did not wiggle. Power cord tested fine with a volt meter test on the cord & plug, and trying another power cord with the same no power on result, I dis-assembled the laptop. Usually a no power via power cord, no battery charging points to a bad power cord OR broken dc power jack inside of the laptop. Neither was the case with this Dell M5030 laptop. DC Jack Repair. First off, this is a guide and by no means does Lightspeeds Computer Repair take any responsibility in the dis-assembly of your laptop by this guide & photos, and you damaging the laptop. Dis-assemble at your own risk. The Dell M5030’s dc jack visually looked solid, with no visual damage. Multi-meter tested 19.5 volts from the dc jack to motherboard. I looked hard at the solder joints on the dc jack, I did not see any cracks in the solder connection (9 pins). I grabbed a bit of flux, de-soldered, cleaned and re-soldered the 9 dc jack pins. Hoping there was a small break in the laptops dc jack connection to the motherboard, but there was no difference. The dc jack was supplying the motherboard with the correct volts. I un-plugged the power cord and pulled the CMOS board battery out for 15 minutes. Attempting now to reset the Bio’s & motherboard to fix the problem, but same result, no power on via power cord. I connected battery to motherboard, battery still some juice, the LED lights and fan spun up with battery. But still would not power on via power cord only. This Dell Inspiron M5030 simply was not accepting any power via the cord anymore. I removed the heatsink and removed the fan housing, and this is what I found. Massive dust blockage on the heatsink exhaust. This Dell Inspiron M5030 was overheating, overheated big time. As you can see in the photo to the right the internal exhaust is blocked completely by dust, hair build up which has blocked any hot air out of this laptop. 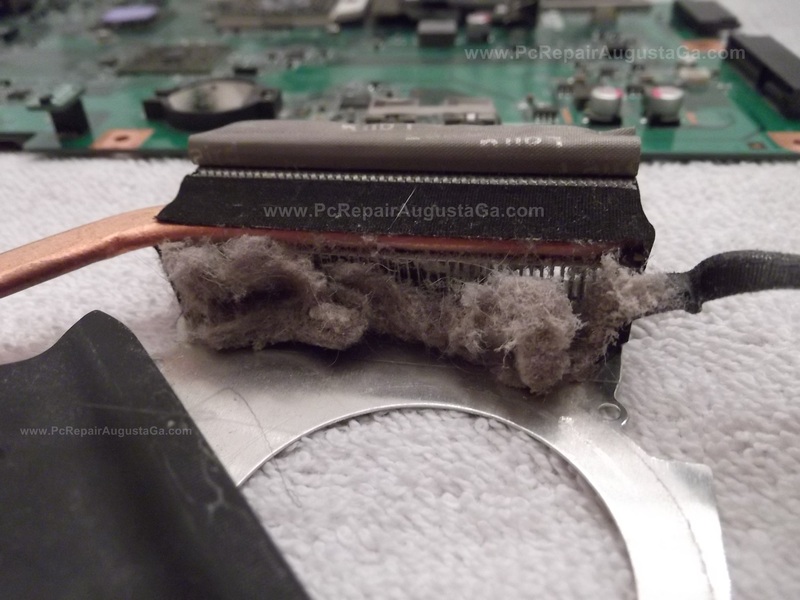 This laptop had a definite cooling problem, and was overheating. 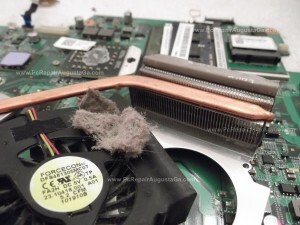 Can easily say this laptop was overheating continuously for a long time by the amount of dust, hair build up inside the heatsink exhaust vent inside. Hot air cannot exhaust out of the laptop this way. I stepped away from for an hour called the customer and explained to him what I had found. It was not the dc jack as the customer and I first suspected. Told him this laptop was overheating, and overheated bad and has damaged the motherboard. It runs on battery, but will not accept any power via power cord anymore. Defective motherboard. I stepped back to the motherboard a few hours later and decided to use the multi-meter to see if I could trace the power on the motherboard. Not really expecting to be able to actually do anything as far as so much even tracing the power break, but just do not like to give up on a cosmetically good shape laptop. So I began by checking these circuit chips closest to the dc jack. The yellow and blue highlighted pins in photo is the dc jack pins on the backside of motherboard. 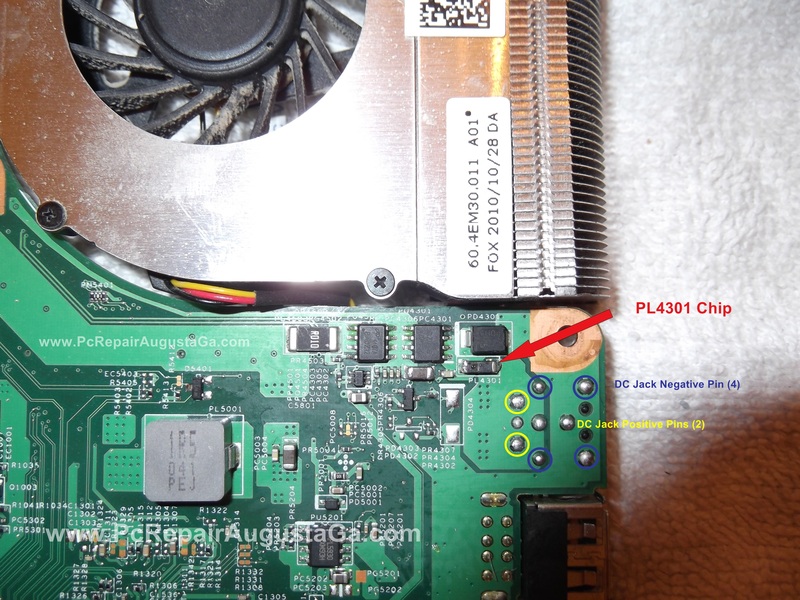 With the Dell M5030 motherboard plugged in, when I hit or touched this chip with the multi-meter,, highlight with red arrow in photo, chip PL4301 the motherboard front LED lights lit up, and the fan spun up. And stayed on! I unplugged the laptop, plugged back in several times, hit the power switch and motherboard turned on everytime. You can see the motherboard negative “trace” circuit runs from 2 of the negative dc jack pins right under that PL4301 chip. Could be some type of board fuse, not sure. Also note where these fault circuits are located, very close to that blocked fan exhaust. This laptop had major heat building up from the blocked exhaust right on this area. The PL4301 chip, circuit or area around that chip is at fault. Not sure exactly what this PL4301 chip is, or what I did by touching it with both negative and positive cables from multi meter. But I just located the problem. I looked real good at this PL4301 chip with a magnifying glass, to see if there was maybe a break in the solder joints or shoulders on this chip. I did not see anything. I did heat and re-solder the “shoulders” on this PL4301 chip to the motherboard. I left motherboard on for few hours, turned off, and turned on with no problems. For asking or searching, the Dell m5030 has a intergrated video graphics chip which is a circuit chip built into the motherboard. The video graphics chip cannot be upgraded, replaced or repaired. Photo right shows the motherboard, the video graphics chip is below that silver heatsink plate. The small silver “coin battery” (photo upper right) is the motherboard “CMOS” battery. With main battery out, laptop unplugged, popping this CMOS battery out drains all power from the board, and sometimes if your lucky resets board back to working order. This was not the case with this one, for it did not work. As you can see in the photo above, this dc jack and these group of chips are right next to the heatsink and cooling fan. All I can assume is the heat build up from the blocked exhaust might of melted or cracked the solder on this chip, resulting in the no power from cord issue. I cleaned the heatsink & fan assembly, and cpu chip. Applied Arctic Cooling MX2 thermal compound to the cpu and re-installed heatsink & fan. Re-assembled laptop, good to go. After dis-assembling this Dell M5030 this was looking like, and was a junk dead laptop, that was brought back to life. 4 weeks later, after this post, laptop failed again, no power via cord, thus no battery charge. Problem lies in the internal circuits of the motherboard or that PL4301 chip & area mentioned above and in photo. I did not attempt to repair the laptop again, blocked fan exhaust, overheat conditions, motherboard is defective, no good. A circuit trace runs from the negative dc jack pin right under this PL4301 chip. I might of been able to get laptop going again, it most likely would of went out again after a few weeks, and an on going repair. Excessive heat can damage the internal circuitry of the main board, circuits that you cannot see inside of the board itself. Very important to keep the laptops cooling vents blown out periodically with a compressed air can, when the laptop is off! Updated 2-9-13: Seems to be a surge in searches for this Dell Inspiron m5030 model experiencing the same problem here in the last few months or so. This article the last month has been receiving 40-60 searches and views a day. Poor quality and workmanship by Dell once again, does not surpise me. Other than the heat issue, fairly easy to assume Dell put a bad motherboard in these laptops. Laptop internal heat, with a cheap poor quality motherboard = failure is imminent. I cannot stress enough laptops are very delicate, and heat is the ultimate death sentence for a laptop. Unlike desktop computers, replacement motherboards for laptops are basically not available. Through manufacture, your looking at a price maybe $175-$300 for a new motherboard for your laptop. You might find one used / refurbished on ebay still at a very high price. If the laptops motherboard fails, the laptop is now a paperweight, junk, not reasonable to repair in most cases. A replacement motherboard for your laptop MUST be an exact part# match to the one coming out of your laptop. Laptop Motherboards, pure and simple, not available. Through the laptops manufacture, probably,, but you might as well buy another computer. 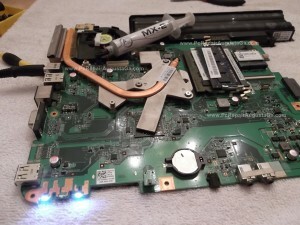 You might find a vendor that has the exact motherboard you need for your laptop, which is usually a “working pull”, used, refurbished from another same model laptop, STILL at a high cost. Defective laptop motherboard = time to go shopping for a new computer basically. 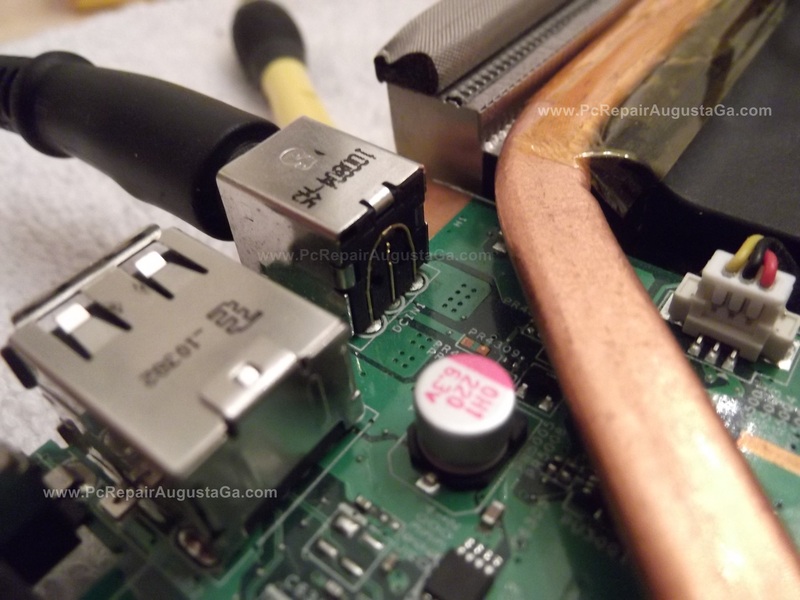 Checkout what I found in an expensive 17″ Asus G72gx gaming laptop a few weeks ago. reviews and additional data, is there any other site which provides these kinds of stuff in quality? Unfortunately, this laptop died completely twice. Once when the customer brought it in – laptop was dead with no power lights, thought was a broken power jack. Power jack was tested fine, board receiving power via power jack with multi-meter. That area in photos above is the fault area in the circuits. Managed to repair it once, board power back on laptop running fine, fan clean, fresh thermal paste, and good temps. 3-4 weeks later customer called told me laptop failed again with no power at all again. It was not high temps now. I did not try to repair it the second time. This was not just a no “charging” problem with the battery, was a no power at all situation, no battery charge, laptop not accepting any power via the power cord. Somewhere near those circuits in photo above or internal within the board. The fan exhaust was completely blocked, and that area is very close to the heat build up from the blocked exhaust. So I figured the heat has damaged this board internally now. 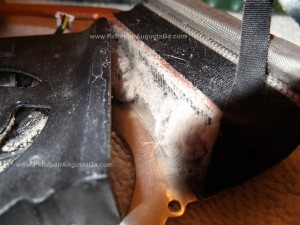 If the fan is blocked inside (high temps) it needs to cleaned out from the inside. Adjusting fan speed might work for a short time until the fan pulls more dust/hair into the laptop while it’s running high speed 100%, and blocks the heatsink exhaust off completely. Then it will begin to run hotter with higher temps. High temps in laptop is the #1 cause for laptop & hard drive failure. Death sentence for any laptop. With one cooling fan and exhaust, it gets blocked off, “running” days are numbered. Keep your important data backed up at all times. Same issue here, replaced the jack but still not getting power (although I wasn’t getting voltage on the board until I replaced the jack, may have been damaged by the customer wiggling and messing with it). I have recently had some good luck reflowing the video chips of several HP, Gateway and Dell laptops that were pretty dead (lights came on then off, or laptop never showed any signs of life). After a reflow with some no clean flux they all came back beautifully, now to see how long they will last. So I think I will try reflowing the video chip on this M5030, and also touch-up the chips near the DC jack, we’ll see if it makes a difference. Good page, I should have looked the issue up sooner but it seemed like such an obvious DC jack issue. Yes, I to thought the dc jack, but multimeter on the inside told me different. Even re-soldered the jack, same. That area I have in photos, touching that chip with multimeter immediately powered the board on, WITHOUT the on/off switch. I purposely had the board plugged in to see what would happen if i touched any of those chips one by one. This page has been receiving alot of views lately all with the same basic search terms,, seems to be a problem board, similar to HP’s dv series laptops. Sent message thru Facebook back to you, with links to Newegg.com. Hard drive docking station or USB to Sata Adapter Drive enclosure. Basically same that happened with this M5030. I got two laptops a dell inspirion that seemed to go out wile using usb plug. Now plugged in it gets extremily hot immediotly on motherbored dc everything cheeks out but fans and screen show no life. And my hp pavilion dv3 wile plugged in push power fan all ligts but lcd screen cpme on about 3sec then all cuts out. Wont start at all w batterry out and. Ilthe ac light blinks wile plugged in and a verry low sound almost a tic or if snapping thin plastic lightly evrery 3 seconds well continue. I have never seen a “Dell branded” hard drive, I don’t think Dell manufacture there own drives. Toshiba and HP does though, which are much lower quality drives over the standard Western Digital or Seagate drives. I have seen Toshiba branded drives in Dell, HP, Gateway etc. Other pc manufactures will by them from Toshiba because they are cheap. The HP you described sounds like a typical HP motherboard failure (blinking AC lights while plugged in, screen goes black) which HP laptops are known for. HP usually puts white “HP part#” stickers on just about all hardware in there laptops, even the memory. Memory brands vary between laptops so hard to tell what is original. I can’t thank you enough for this help. I had the same problem with my m5030, looked like dc jack broke off the board, but as you mentioned, the solders on this PL4301 were off, as I touched it with a screw driver it could see it sparking a little. So I went ahead and soldered both the sides on that PL4301 and it started charging again. My heat sink and fan were clean from a previous service, I think it overheated sitting on the couch, does get very hot this AMD based laptop. Thanks again for the incredible help.